from my good friend Danni from Oh, hello friend! This Give Away is here to celebrate! 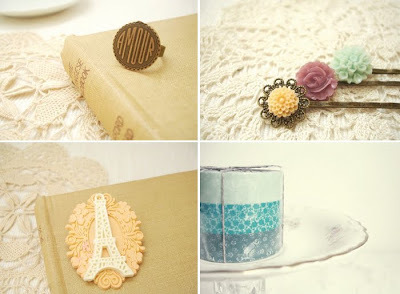 A ring, a hair pin set, a cameo brooch and a pack of Japanese tape. and comment on this post with your favorite item from the shop. and comment on this post with the link to your post or tweet. what you are celebrating today! this opportunity to thank some amazing people! I had never could have done this without you! I love ordinary day - simple whistle necklace. I am happy that spring has finally arrived! Firstly I love the new layout, particularly the pretty lace down the side, a beautiful touch. 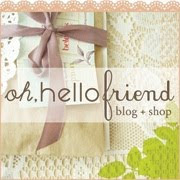 I am going to blog about this giveaway as oh hello friends items are so pretty. Today I am celebrating the fact that the sun has come out to play. Living in Ireland this is a rare thing. Those are the most pretty designs ever! They style of the Etsy shop is fantastic. I'd coose EVERYTHING of course, but Time of my life is a necklace that catched my eye right away. I will post about the give away. What I celebrate today? Well, tonight we're celebrating Shabat! oh... i love so many of the things. maybe the romancing me ring and whisperous rain III . I am celebrating another new day... with a nice hot bath and a cup of tea. Each new day only comes once in a lifetime, it really is something to celebrate! Also, your end date for this giveaway should be April 16, no? I am celebrating it being sunny, time for bare legs and sandals! Love your blog and the new layout! oh, i love everything in that shop but the most beautiful thing there is; of love - antique brass amour ring. I love it so very much!! I am celebrating the things that I celebrate everyday - my family, my health and my freedom. My favourite item in Danni's store is the Simple Whistle necklace. I love the " time of your life pocket watch clock necklace"! Great giveaway! Woah, what a lovely giveaway and congratulations on your new blog design, it looks fabulous! The pieces on her shop are amazing and it's really hard to choose something, but if I'd had to, I'd definitly go for the "moment in time pocket watch" or the "grace earrings" as they are just fitting so much to the spring right now. Would still love though to win this lovely giveaway as all the items are just as cute as the rest of her shop! Hope you all'll have a great weekend, go celebrate spring! Thanks for the opportunity to win such lovely stuff! I am in love :) with the amour ring! vandaag vier ik dat de bloesems uitgekomen zijn en dat ik met mijn fiets in de zon rijd zonder slotjes in mijn mond! oh, danni is such a sweetheart! i am in love with the time of your life pocket watch necklace. i hope to win this incredible gift! What an amazing giveaway! I have often looked at the Oh hell friend shop and drooled over the beautiful items. I think I am most excited about the hair pins, maybe because I feel like my hair needs something recently to give it a bit of whimsy. I love this giveaway, I love all items of the O hello friend shop, but I like one item the most. The rose garden - lovely rose ring in dusty pink. It's so delicate and beautiful... I love it. gosh, every single item in the shop is just so....PERFECT!!! although i`d be happy with everything, i guess i`d choose the "there for you - french charm and eiffel tower necklace". ....today i will celebrate my best friend`s birthday! Today I am celebrating my best friend's birthday! She's miles away from me in Spain which makes it sad, and unable for us to have a rumpus, but when she returns this summer, we'll fix that! lovely giveaway, inDEED. my favorite thing right now would be the floral bouquet ring! Being Alive! Something we should all celebrate EVERY day! Ooh so hard to choose a favorite. I think I like all the cute bobby pin hair clips..they are all so cute! I am celebrating the weekend today since I work tomorrow! Love the bird cage necklace or the hot air balloon one. Such a cute shop! I am celebrating life today! I have learned that it is all to fragile and not a right, but a gift. i adore her shop and blog :) i got the compass necklace for a friend who travels a lot- so she'd always know where home was. Danni always packages things pretty so it's a go to place for gifts. today i'm celebrating my last weekend before i start a new job next week. Today I celebrate I finished my homework early! And that it's weekend! And the super nice weather! Today I'm celebrating Friday, The Beautiful Day, Graduation approaching, and so many people that I am fortunate to have in my life. Looks like I found your blog on the right day! What a great contest. I love today because I finally had the courage to reapply to university for a different major. I love so much the pins. Oh there are sooo many cute things in this shop! I think my favorite is the "stay a while - simple tree necklace." Today I am celebrating my newborn nephew. What a beautiful baby he is! It fills my heart just to hold and look at him. I visited the Oh hello friend shop & I adore the nest(ed) vintage floral hair pins and the time of your life pocket watch. So many adorable items! The layout is gorgeous! I always skip over entering contests, because I never win, but I thought i'd try anyways! today i am celebrating just how lucky i am! what a great giveaway! i am celebrating friday, the end of another week and start of the weekend! yay about the layout too! it looks so great and all our effort and time put into it turned out wonderful! today I'm celebrating creativity and the many ideas I have swirling around in my head that I can't wait to turn into a reality. Love all 4 things! So perdy!!!! I am so sorry I missed this! Anyway, I will share my celebration with everybody! Today I am celebrating a little baby's first going to the church! I simply love babies so it will be a great joy for me! I am also celebrating that I have the best bf. He is French and I would have loved to show him the "Amour" ring, but c'est la vie! I absolutely adore the beloved vintage hair pin set ! Good luck everybody. Today I will also celebrate subscribing for this! Email adress: ary_ko(at)yahoo.com As I said, heads in the clouds! I am celebrating my sister, grandma, and exboyfriends birthday! celebrating out of town family and how happy they make me! i adore the papparazi - a filigree camera ring in the shop..its perfect. I am celebrating that I have most probably found the man I want to spend the rest of my days with! i missed reading your blog. thankfully i have the internet back so i can read it again! it's still fantastic! my favorite is the melody - petite harmonica necklace. love the amour necklace and ring! I've visited the shop... and the 'hoy air balloon necklace' inmediately caught my eye! Elkaar linken een leuk idee? I love your blog so much, it's adorable! Today I am celebrating the lovely weather that has been taking over! i love, and today celebrate, flowers of all kinds and colours (especially pink peonies)! I am celebrating our new car, family and the sunshine! Today we had a lazy morning, went to the garage to pick up our cute, little, white run-around; "Semolina" then picked up the family and drove to the beach. Now we are cooking lamb curry and will have a lovely evening over with the rents and sisters! I would name this day 'national semolina day' for that is definitely what we are having for dinner! Celebrating a day in the life, and life is good. i love all of her jewelry! Everytime she stops by Irvine I always end up getting at least 3 things!It's just so cute! i love the Maybe Someday French Amour Vintage Style Necklace!to die for! I love the Glimmer of Hope Paper Crane Necklace! Everything in the shop is so lovely and delicately pretty. I am celebrating my best friend's 21st birthday today! While she goes and enjoys the bar scene, I'm babysitting her beautiful baby! It's been a great day! i love danni! i am huge fan of her up in the clouds (lovely charm button pins)! congrats on the new layout! today i am celebrating being home for my birthday! i have a week off! can't wait to spend time with friends and fam!!! Thanks for a chance at winning! Thank you again for this wonderful giveaway! I just love pocket watch clocks. 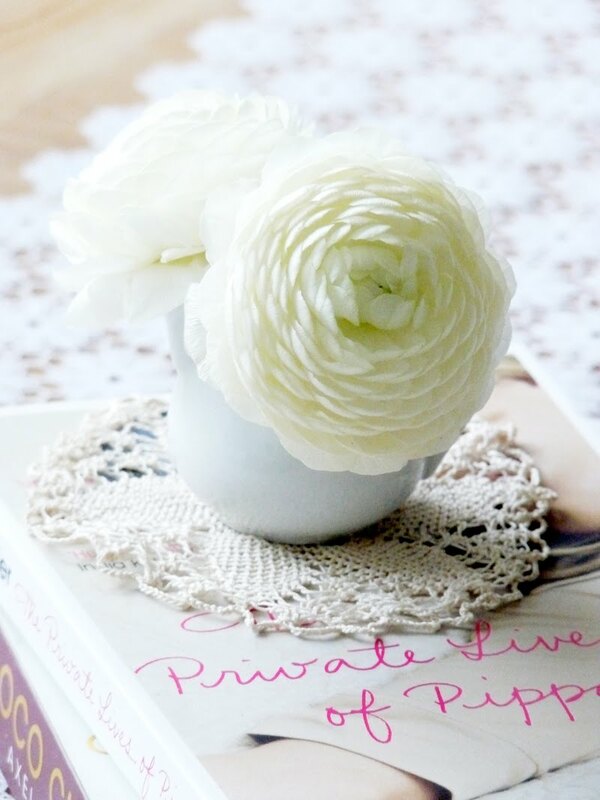 Lovely post, I love your blog! Thanks for the giveaway! Today I'm celebrating the fact that I finished a fun home project. Today I'm celebrating that I don't have go to the University and I can do whatever I wan to do :) And it's spring and just next to my house they selling delicious ice creams! I love your blog btw. So many beautiful things in one place ;] Keep going,good luck! What a beautiful giveaway! It was so difficult to decide on all of the sweet little items (I had to add the shop to my favorites list). I am impartial to the hair pins as I have started quite a collection for my little girl. The candi(ed) ones were especially lovely. Thank you! ...and today I am celebrating the fact that I have the day off :) Going to catch up on my crafting! What a lovely post and everything in her shop is gorgeous! today i celebrate love and how lucky i am in my life to have so much love, an amazing man and incredible friends and family. Third comment! Today I'm celebrating laughter and way-too-bright pink nail polish, I believe it is things like those the ones most underrated and uncelebrated. I'm toasting on orange juice! Hoi Mila! Waw, als ik je bedankje op het einde van deze post lees... jullie 4 vormen samen het kwartet van zowat m'n favoriete blogs! Haha. today I am celebrating love and luck. buried treasures, special friends, and living life in the city. From the site: I love the 'time of your life' pocket watch necklace. Thanks for a chance to win your lovely giveaway. Today I celebrate life, health and prosperity. I love transformed by - a vintage sewing machine necklace by oh hello friend. Lovely lovely pieces! i am celebrating a move and all the hope and dreams it brings with it! i DIE for the Japanese tape!!! SOOO adorable! Today I am celebrating a couple of friends birthdays, and also knowing who i am because as a bit of an introvert i'd rather not go to the party. But i am optimistic it will turn out ok! at last - vintage kissing sparrows necklace.